The two prints in this diptych [see EA1983.69.b] were originally part of a pentaptych depicting five heavily-tattooed thieves, the leading characters in a play based on the exploits of a gang of real-life thieves in eighteenth-century Japan. The thieves were presented as heroic commoners who stood up to the powerful samurai on behalf of the people. 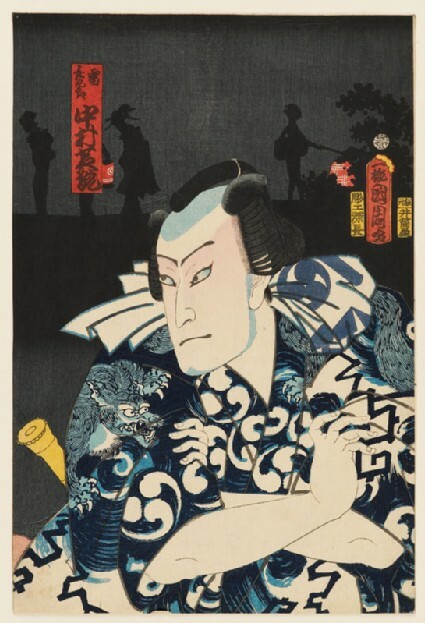 The design of Kunichika’s pentaptych is modelled on a similar work created the previous year by Kunichika’s teacher, Kunisada. The figures and dress are almost identical; only the actors’ names and faces and the background are different.